She was joined by Duke University’s William Pan and FHI 360’s Tricia Petruney to discuss lessons learned and the future of the population, health, and environment approach to development. Kalema-Zikusoka never expected to be so deeply involved in reproductive health initiatives when she started CTPH a decade ago. 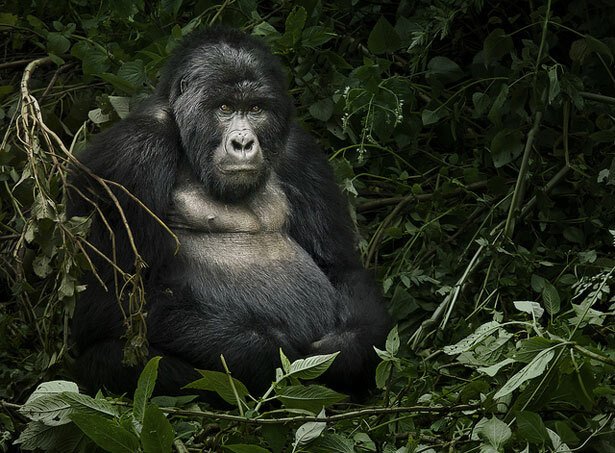 Bwindi Impenetrable National Park is one of the most important biodiversity hotspots in central Africa – home to half of the world’s remaining mountain gorillas – but it’s surrounded by “some of the most densely populated areas” of Uganda, she said. People and animals frequently cross park borders and enter each other’s territory. To prevent cross-species transmission of diseases like scabies, CTPH created “village health and conservation teams” to improve hygiene, increase access to sanitation, and treat infectious diseases among the people living in surrounding communities. The teams are also trained to respond to gorilla incursions into villages and gardens prevent violence and unsafe contact between people and animals. While seeking funding for her work, Kalema-Zikusoka was encouraged by a USAID officer to apply for funding to add voluntary family planning services to her project. She was initially dismissive of the notion: “How could we distribute condoms to people around the national park?” she said, “That’s not what we’re doing.” But after observing how thin the resources of the region’s large, impoverished families were stretched, she recognized that improving access to family planning could advance CTPH’s conservation goals and improve the well-being of these families. With funding from USAID, the teams began distributing contraceptives to those families who requested them, accompanied by easy-to-understand narratives explaining how families with fewer children are able to afford schooling, leading to different life outcomes than families where only some of the children can attend school. CTPH’s programming also expanded to other poverty-reduction efforts. Our volunteer teams “came to us and said, ‘Can you give us goats, and can you give us cows? …We want to sustain ourselves,’” Kalema-Zikusoka said. “So we gave them group goats and group cows, and they went ahead and developed their own income-generating projects.” CTPH also brought internet access to the area via a new telecenter. Hoping to help others learn from their example, CTPH partnered with FHI 360, a NGO supporting integrated, comprehensive development efforts, to create an advocacy plan for the Uganda PHE Working Group, a coalition of government and NGO groups supporting PHE projects in the country. CTPH hosted a three-day study tour of their sites in Uganda for members of the working group, designed to show other health and conservation organizations ways they can break free of the “vertical silo” of single-issue outreach. “The staff has to become familiar with a whole new universe of policies, regulations, and guidelines…and evidence, and indicators, and tools,” Petruney noted. “No matter how strong the rationale might be for PHE, or even the commitment of a passionate program to it, I don’t think that these are minor details.” It’s one thing to know about PHE and understand its potential benefits; it’s another to deliver “evidence-based programming” in the real world. The best way to overcome these knowledge barriers is to follow the model of CTPH and FHI 360 and partner with other organizations, she said. Providing a historical perspective on today’s PHE programs, William Pan pointed out that while Thomas Malthus’ infamous predictions of famine and disease turned out to be dead wrong, he did identify some of the most fundamental dynamics between human population and the natural environment. Since then, the field has evolved considerably, bringing, among other things, a strong focus on a rights-based approach to expanding voluntary access to reproductive health care and protecting biodiversity hotspots – as demonstrated by CTPH. Still, “we really haven’t solved a lot of the issues that have been stated even 200 years ago,” said Pan. In part, this is because of a disconnect between the academic world and practitioners in the field. Creating more partnerships with researchers and introducing more rigorous analysis of PHE results might help to expand the approach, said Pan. He also suggested that the “E” in PHE should be broadened to include the built environment, and that interventions could encompass more aspects of public health besides reproductive health. Perhaps the biggest challenge for existing PHE programs, the panelists agreed, is generating funding. Despite the seeming success of programs like CTPH, donors accustomed to one sector sometimes find the results or methods from another sector confusing. Pan said he has proposed an “evidence lab” at Duke University to focus on quantifying the results of PHE programs. He also helped establish the North Carolina One Health Collaborative, an integrated research and training program designed to “enhance collaborations among physicians, veterinarians, public, environmental, and other local/global health professionals.” By training researchers and policymakers how to not only quantify and present cross-sectoral results to donors, but also expand beyond reproductive health, Pan said he hopes the Collective will make the leap to PHE more viable. At CTPH, the immediate focus is on continuing a good thing. Kalema-Zikusoka said they hope to build a community health and gorilla conservation center and develop a curriculum in PHE studies to continue serving communities in Bwindi, Virunga, and beyond. Photo Credit: Mountain gorilla in Uganda’s Mgahinga Gorilla National Park, courtesy of flickr user weesam2010.